New light-vehicle sales across Europe have increased 7 percent to 4.48 million cars through April. 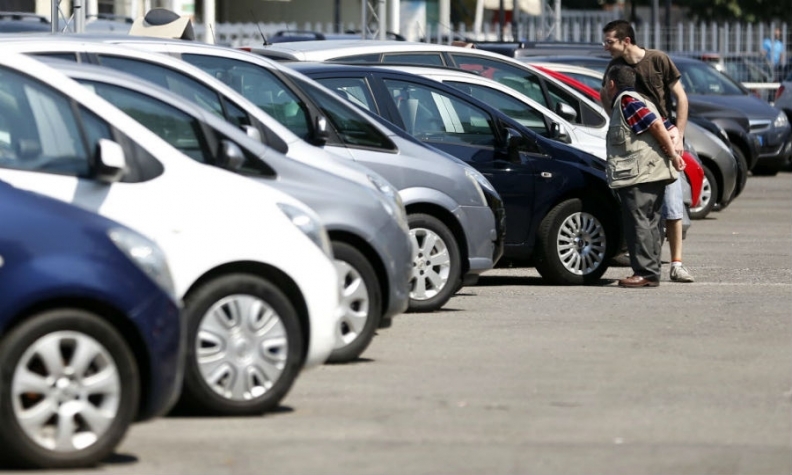 BRUSSELS (Bloomberg) -- European car sales rose at the slowest pace in five months in April as doubts about economic growth in the region contributed to a drop in Germany. Registrations increased 4.2 percent to 1.13 million vehicles from 1.08 million a year earlier, the Brussels-based European Automobile Manufacturer’s Association, or ACEA, said today. Four-month sales gained 7.1 percent to 4.48 million cars. Economic expansion in the countries sharing the euro has been unsteady since a recession ended a year ago, with Italian gross domestic product shrinking in the first quarter and French GDP stagnating. Car sales in Germany, Europe’s largest market at about one-quarter of deliveries, fell 3.6 percent in April, while Italy’s gain was just 1.9 percent. Growth was also was held back by a decline at the namesake brand of market leader Volkswagen AG and a slower-than-average increase at Fiat SpA. Group European sales by Volkswagen rose 4 percent. Growth was damped by a 1 percent decline at the VW marque, which is revising its mid-sized Passat sedan later this year, and a gain of 1 percent at the Audi luxury unit. Fiat’s sales increased 2 percent as deliveries dropped at the Lancia and Chrysler units and at the Alfa Romeo division that’s being retooled into a premium marque. Industrywide sales gains in April were pushed by gains of 16 percent at Renault SA, 9 percent at Ford Motor Co. and 5 percent at Paris-based PSA Peugeot Citroen, Europe’s second-biggest auto manufacturer. Renault’s no-frills Dacia nameplate has revamped the Duster SUV and Sandero hatchback, while the main brand of Boulogne-Billancourt, France-based Renault has attracted buyers with the Captur crossover brought out a year ago. Peugeot said in early April that it’s raising production of the 2008 compact SUV as orders soar for the model. The ACEA compiles figures from the 28-country European Union, excluding Malta, as well as numbers from Switzerland, Norway and Iceland. Auto executives in the region are predicting industrywide delivery growth of 2 percent to 3 percent for 2014, following a six-year contraction to a two- decade low in 2013. The increase last month was the slowest since November, with demand hurt by the Easter holiday shifting wholly into April this year. The period took place partly in March in 2013. Germany was the only market among the top five in Europe to post a decline last month. Demand surged 29 percent in Spain, which ranks fifth in Europe, and rose 8.2 percent in the United Kingdom, the No. 2 market. Investor confidence in Germany fell a fourth straight month in April, and has declined in May as well. European Central Bank President Mario Draghi primed investors last week for further stimulus in June, saying the 24-member Governing Council is “comfortable” with easing monetary policy next month. Opel, the German brand of General Motors, and its sister Vauxhall division in the United Kingdom sold 7 percent more cars in Europe last month. The automaker is targeting full-year growth with models such as the Adam city car. GM’s group sales in Europe fell as the Chevrolet brand, which is being withdrawn from the region, scaled back deliveries. Discounting by Opel dealers was the deepest in Germany last month, with cuts averaging 15 percent off the recommended price, according to trade publication Autohaus PulsSchlag. Industrywide incentives in Germany averaged 12 percent in April, including discounts of 14 percent from the French carmakers and 13 percent at Fiat. BMWAG, the world’s biggest maker of luxury cars, sold 0.5 percent more autos in Europe as a 3 percent gain at the namesake brand compensated for an 11 percent drop at the Mini small-car marque, which is updating its lineup. Daimler AG’s Mercedes-Benz division, which ranks third in global premium-vehicle sales after BMW and VW’s Audi, posted a 2 percent increase. “The business environment remains volatile and uncertain,” BMW CEO Norbert Reithofer said at the Munich-based manufacturer’s annual shareholder meeting on Thursday. Among Asian carmakers, Honda Motor Co., with an 8 percent drop, and Hyundai Motor Co., with a 4 percent contraction, posted sales declines in Europe. Toyota Motor Corp., the world’s biggest auto manufacturer, sold 3 percent more vehicles, helped by a 37 percent surge at the Lexus luxury marque. Jaguar Land Rover, the high-end U.K. division of Mumbai-based Tata Motors Ltd., delivered 27 percent more cars and SUVs.